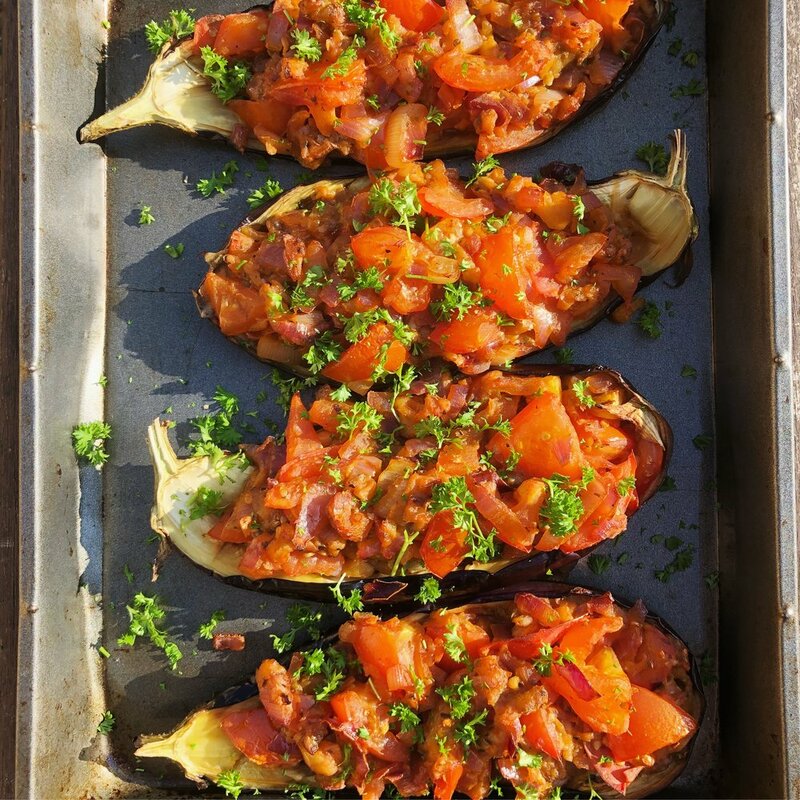 This aubergine dish, full of spices, rich tomatoes, and tender smokey aubergines is so tasty that, as legend has it, the Turkish Imam fainted with pleasure when he tried it (hence the name which translates as 'the Imam fainted'). There are hundreds of versions of this dish as it's eaten across the former Ottoman empire regions, from South East Europe to Western Asia, each region having its own influence. 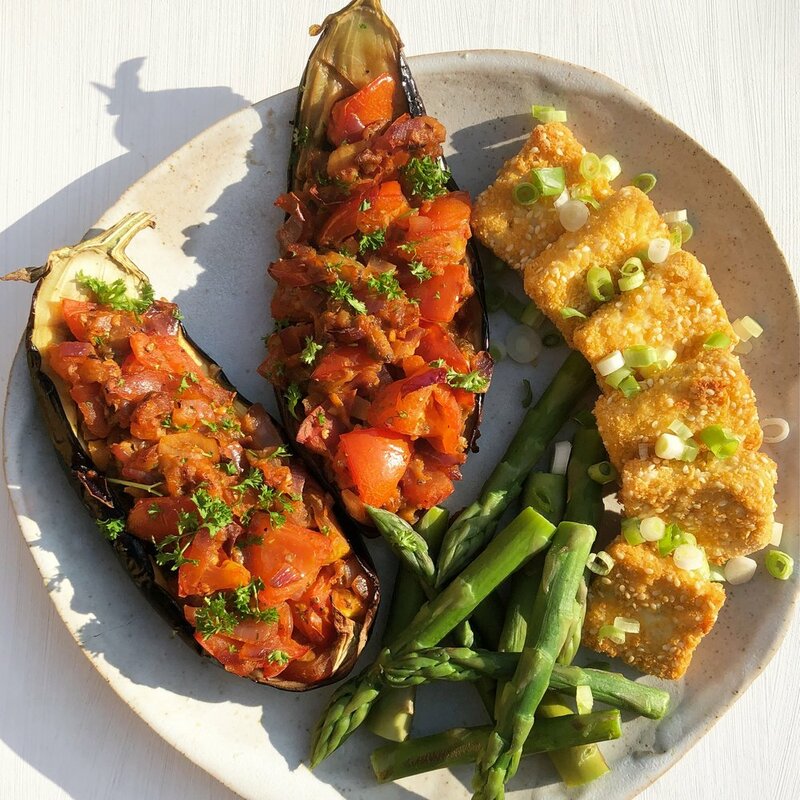 This recipe involves two stages of cooking your aubergine - the first step can be done however you like - in the oven, on the BBQ, or wrapped in foil among hot coals (the latter two options can create a delicious smoky flavour). For the second step, once stuffed, you just finish them off in the oven to let the flavours infuse and reduce to become thick and rich. This vegan Imam Bayildi recipe can take centre stage on your plate, served with some rice or fresh bread to mop up the juices, or works well as a side dish. I served mine up with some crispy sesame coated baked tofu and steamed asparagus. Heat your oven to 180C (350F). Half your aubergines lengthways, score the flesh deeply in a diagonal pattern, then brush with 1 Tbsp of the olive oil. Pop them on a baking tray and roast (or arrange them on the BBQ) for 20-25 minutes until the flesh is browned and soft enough to scoop out. Now heat 1 Tbsp of olive oil in a frying pan and saute the onion for around 5-10 minutes until soft but not coloured. Add the garlic and spices, and cook for a further minute, stirring to release the oils from the spices. 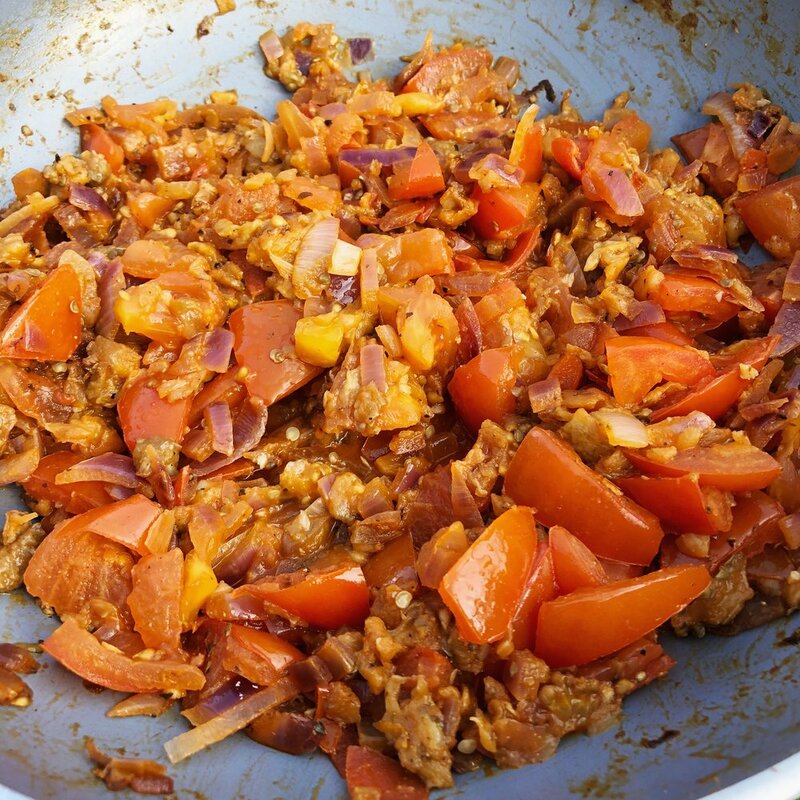 Add the chopped tomatoes, sugar, salt and pepper, then scoop out the flesh from the aubergines, roughly chop, and add it to the pan. Allow to simmer for around 10-15 minutes, then add the parsley. 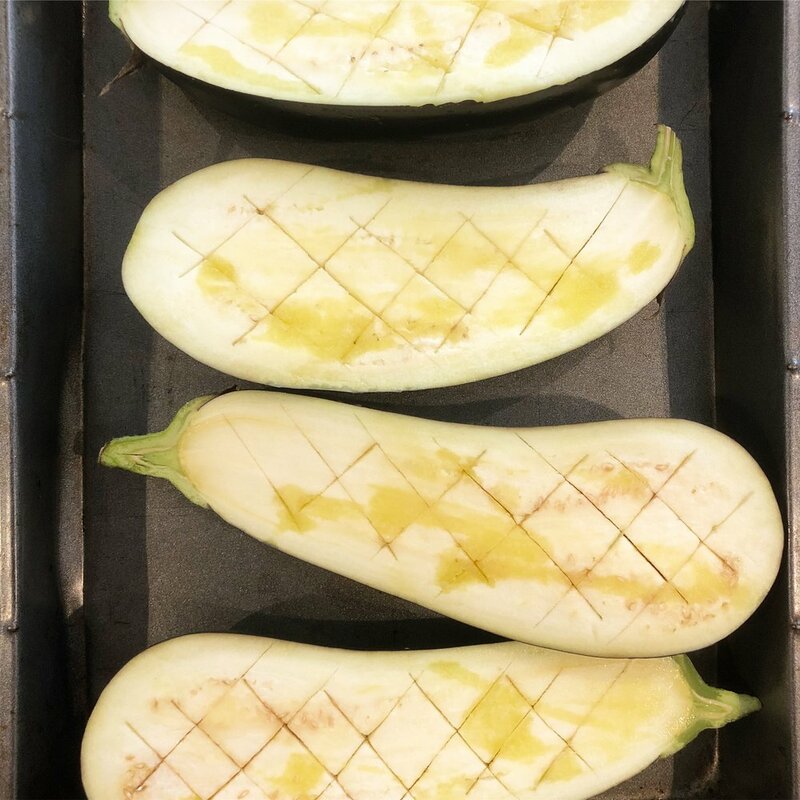 Lay the empty aubergine halves on a baking tray, then stuff them with the tomato-onion mixture, filling them as much as you can (don't worry if some spills out). Then place in the oven to bake for 30 minutes. Remove, scatter with a little more parsley and enjoy warm or allow to cool and eat at room temperature.